I am the ShadowKnight HavocDijin. I am the vice chairman here in LunaKingdom. On behalf of the guild I would like to welcome one and all to the guild LunaKingdom's site. LunaKingdom is a relatively new yet quickly growing guild on the Eclipse server of LUNA Online. One can typically find most members on Channel 3. We are a friendly guild with a wide range of active members. Currently Tier 2 level character classes make up the majority of our guild. If you would like to join or would like to ally your guild with us, then please contact either PrinceDanny or myself (HavocDijin) for more info. Once again I would like to welcome you all to our site. Please enjoy yourselves and remember that as a member of the guild you get access to many helpful resources and most importantly friends! Limits on guild size are based on guild level. Currently we are level 2 making the maximum number of members we can have is capped at 25. 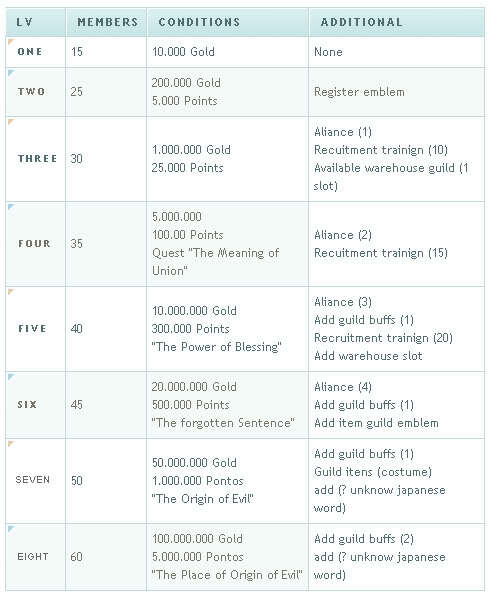 Here is a listing of maximum guild size and LUNA benefits for being at each level. The points come from quests completed once you are in the guild. Guild members generate "guild points" whenever they complete a quest. These points are similar to exp except. Don't worry, it doesn't get taken out of the exp you already earn from quests, it's just a little something extra that only is given once you join a guild. To level up the guild three things must be done. 1) The number of points stated in the conditions column must be reached. This is done by guild members completing quests. 2) The amount of gold required needs to be gathered. 3) The chair must go to the guild manager in Alker Harbor and choose to level up the guild. Gold required for level up will be paid to the NPC, while experience remains the same. And that's it. Hope it was thorough enough for you. Keep on questing! One question... does the guild warehouse only collect money? Or can items be stored there? If so, is it accessible by all members, meaning they can take items from the storage that aren't theirs? If so, that's very good news. Instead of selling items I no longer need, I could recycle them by giving them to other players via the storage. Provided that's okay with you. because it is understandable that space must be conserved when possible. Just as a little tip, I can happily pay the expenses for making the guild level 3. As far as I know the guild warehouse is available to all members to store both money and items. So yes it could be used to recycle items in that same method you mentioned earlier. There will and I believe already is a limitation on which members can access the warehouse, currently it is set to all ranks above and at "Regular Member" status. As for the payment to level the guild, just pay what you can. It's everyone's guild and (ideally) everyone puts in to make it better. It's like our little LUNA home. Everyone wants a nice home, right?